This month’s selection is Bespelling Jane Austen, which is actually an anthology featuring four short stories inspired by Jane Austen with a paranormal twist. 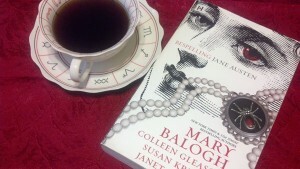 Almost Persuaded by Mary Balogh. We decided to give ourselves more choices: read them all at once, pick the one that interests you most, or in whatever order you would like. February can be kind of a distracting month, and it is also a short one. I’ll be reading and discussing Almost Persuaded while Sarah will be reading and discussing Northanger Castle. Now we may end up reading them all, but we didn’t want to plan something and then flop on our follow through. (Sometimes that happens as we dig into our busy lives.) We decided that it was best if we lightened our load to see how it went. Will you be joining us? We do hope so.